EARLY HISTORY OF RELIGION. Imagine holding history in your hands. Now you can. 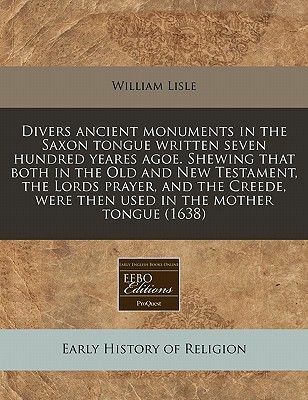 Digitally preserved and previously accessible only through libraries as Early English Books Online, this rare material is now available in single print editions. Thousands of books written between 1475 and 1700 can be delivered to your doorstep in individual volumes of high quality historical reproductions. From the beginning of recorded history we have looked to the heavens for inspiration and guidance. In these early religious documents, sermons, and pamphlets, we see the spiritual impact on the lives of both royalty and the commoner. We also get insights into a clergy that was growing ever more powerful as a political force. This is one of the world's largest collections of religious works of this type, revealing much about our interpretation of the modern church and spirituality. ++++The below data was compiled from various identification fields in the bibliographic record of this title. This data is provided as an additional tool in helping to insure edition identification: ++++"Divers ancient monuments in the Saxon tongue written seven hundred yeares agoe. Shewing that both in the Old and New Testament, the Lords prayer, and the Creede, were then used in the mother tongue"SelectionsTestimonie of antiquitie.Aelfric, Abbot of Eynsham.Lisle, William, 1579?-1637.Parallel Anglo-Saxon and English texts.A reissue, with cancels for the first two leaves, M1, and O2, of "A Saxon treatise concerning the Old and New Testament," 1623. The four cancels were printed as one quire. Variant: with this quire unseparated.Griffin's name from STC.Signatures: pi1 2 pi1! par. ]4 a-f4 A-V4.Duplicate pagination. "A testimony of antiquitie" and "A sermon of the Paschall Lambe, and of the sacramental body and bloud of Christ our Saviour" each have separate dated title page; "Here follovveth the words of Elfrike Abbot of S. Albons" and "The Lords prayer, the Creed, and the Ten commandements in the Saxon and English tongue" have divisional titles; register is continuous.Caption title, p. A1r, reads: That S. Paul, Simon Zelotes, and Ioseph of Arimathea preached the word here in Britanie.The last leaf is blank. "A testimony of antiquitie" was first printed separately by John Day ca. 1566.Identified as STC 15705 on UMI microfilm. 61], 43, 43,! 20], 14, 14,! 25] p.London: Printed by E dward] G riffin and John Haviland] for Francis Eglesfield, and are to be sold at the signe of the Marigold in S. Pauls Church-yard, 1638.STC (2nd ed.) / 160.5EnglishReproduction of the original in the Cambridge University Library++++This book represents an authentic reproduction of the text as printed by the original publisher. While we have attempted to accurately maintain the integrity of the original work, there are sometimes problems with the original work or the micro-film from which the books were digitized. This can result in errors in reproduction. Possible imperfections include missing and blurred pages, poor pictures, markings and other reproduction issues beyond our control. Because this work is culturally important, we have made it available as part of our commitment to protecting, preserving and promoting the world's literature.